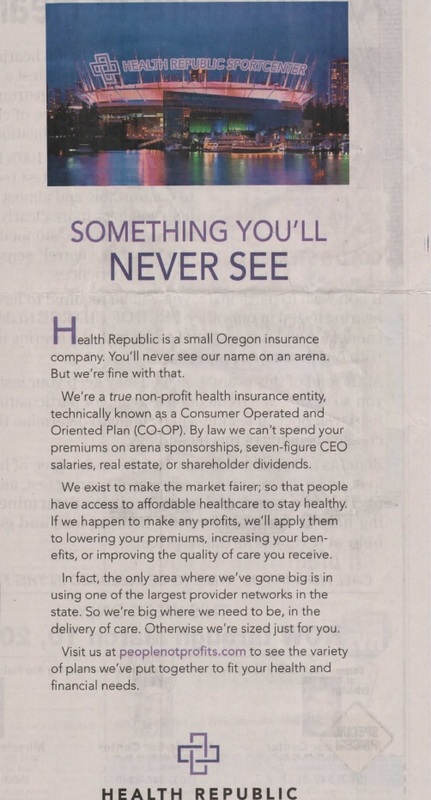 This weekend Health Republic Insurance put out a giant near-half page ad in The Oregonian stating that “You’ll never see our name on an arena. But we’re fine with that.” The hint is likely towards the recent renaming of the Timber’s Soccer field as Providence (Health) Park and the 2013 renaming of the Rose Garden as the Moda (health) Center. The ad focuses on Health Republic’s using its money towards service, customer care and not towards profits. The ad represents an interesting spin on the high profile success stories of Providence Health and Moda which have reaped huge rewards, name recognition, fan appreciation and media attention for their Oregon sports arena sponsorships. You can see the ad below and judge the marketing move and advertising decisions by these Health Insurance companies. Nice to see friendly jabbing being played out on the newspapers. Let the games begin.